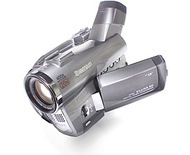 alaTest has collected and analyzed 70 reviews of Canon Elura 90 Camcorder. The average rating for this product is 4.3/5, compared to an average rating of 4.1/5 for other Camcorders for all reviews. Reviewers really like the zoom and price. The portability and image quality are also appreciated, whereas there are some negative reviews about the battery. We analyzed user and expert ratings, product age and more factors. Compared to other Camcorders the Canon Elura 90 Camcorder is awarded an overall alaScore™ of 80/100 = Very good quality. Very compact; vibrant color; big zoom range. Average in low light; poor button layout; badly placed jog dial. A winner when it comes to size, price, and quality, the Canon Elura 90 is an excellent choice if you're looking for a compact MiniDV camera and don't mind occasionally fumbling with awkward controls. A worthy device for the price, the Canon Elura 60 is extremely easy to operate, with decent video quality. Canon hit the daily double with its new video cameras. The Elura is made by Canon Digital and has a MSRP of $1299. Canon is known for producing a great line of high quality digital video camcorders. The Elura is a small matchbox-shaped camcorder. The Elura's 12X Optical/ 48X Digital Zoom lens brings details too distant to be seen by the naked eye into clear focus. Created to fit in the palm of your hand, the Elura lets you capture and combine high-resolution video and still photos onto Mini DV videocassettes. Its 2.5" rotating view screen is perfect for capturing almost any conceivable angle or for immediate playback viewing. The Elura's three shooting modes accommodate any of your needs. Besides, the Elura uses a Progressive Scan CCD image sensor that delivers a significant improvement in performance and image quality. Each and every light gathering pixel on the CCD is used to produce a full frame video image 60 times per second. Recordings of subjects moving at high speed can be viewed on a television with superior resolution. The CCD integrates an RGB Primary Color Filter which separates light passing through the lens into individual red, green and blue color components, similar to professional camcorders. The Elura utilizes the finest method of image stabilization available. It also offers 16-bit and 12-bit audio modes, and is equipped with a DV IN/OUT terminal that conforms to IEEE 1394. In addition to being fully automatic, the Elura offers a complete range of manual controls.